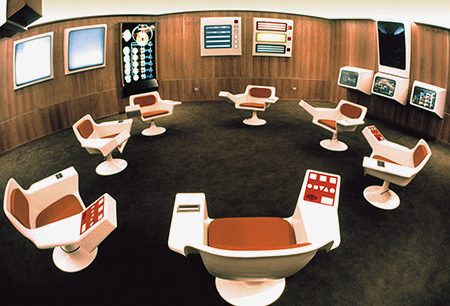 Three years ago we published a post by Nicolas Nova about Salvator Allende's project Cybersyn. A trial to build a cybernetic society (including feedbacks from the chilean population) back in the early 70ies. 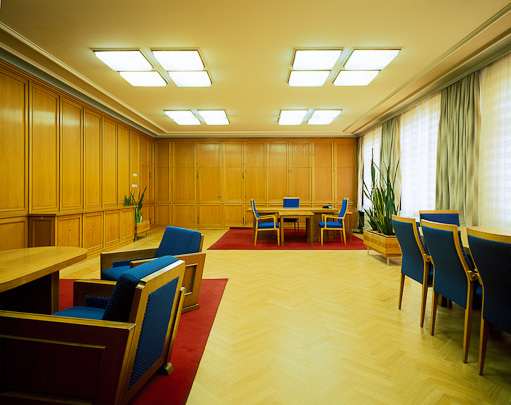 Here is another article and picture piece about this amazing projetc on Frieze. You'll need to buy the magazione to see the pictures, though! This is a tantalizing glimpse of a world that could have been our world. What we are looking at is the heart of the Cybersyn system, created for Salvador Allende’s socialist Chilean government by the British cybernetician Stafford Beer. Beer’s ambition was to ‘implant an electronic nervous system’ into Chile. With its network of telex machines and other communication devices, Cybersyn was to be – in the words of Andy Beckett, author of Pinochet in Piccadilly (2003) – a ‘socialist internet, decades ahead of its time’. Capitalist propagandists claimed that this was a Big Brother-style surveillance system, but the aim was exactly the opposite: Beer and Allende wanted a network that would allow workers unprecedented levels of control over their own lives. Instead of commanding from on high, the government would be able to respond to up-to-the-minute information coming from factories. Yet Cybersyn was envisaged as much more than a system for relaying economic data: it was also hoped that it would eventually allow the pop­u­la­tion to instantaneously communicate its feelings about decisions the government had taken. In 1973, General Pinochet’s cia-backed military coup brutally overthrew Allende’s government. The stakes couldn’t have been higher. It wasn’t only that a new model of socialism was defeated in Chile; the defeat immediately cleared the ground for Chile to become the testing-ground for the neoliberal version of capitalism. The military takeover was swiftly followed by the widespread torture and terrorization of Allende’s supporters, alongside a massive programme of privatization and de-regulation. One world was destroyed before it could really be born; another world – the world in which there is no alternative to capitalism, our world, the world of capitalist realism – started to emerge. There’s an aching poignancy in this image of Cybersyn now, when the pathological effects of communicative capitalism’s always-on cyberblitz are becoming increasingly apparent. Cloaked in a rhetoric of inclusion and participation, semio-capitalism keeps us in a state of permanent anxiety. But Cybersyn reminds us that this is not an inherent feature of communications technology. A whole other use of cybernetic sytems is possible. Perhaps, rather than being some fragment of a lost world, Cybersyn is a glimpse of a future that can still happen. 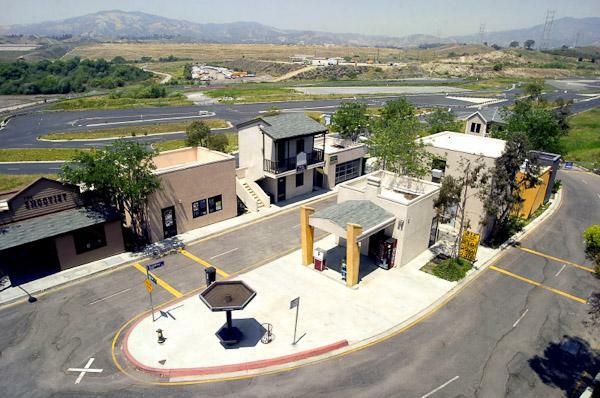 [Image: An otherwise only conceptually related photo by Steve Rowell shows the LAPD's Edward M. Davis Emergency Vehicle Operations Center & Tactics/Firearms Training Facility in Granada Hills, CA; courtesy of the Center for Land Use Intrepretation]. I was fascinated to read yesterday that a cyberwarfare training city is under construction, to be opened by March 2013, "a small-scale city located close by the New Jersey Turnpike complete with a bank, hospital, water tower, train system, electric power grid, and a coffee shop." I envisioned whole empty streets and bank towers—suburban houses and replica transportation depots—sitting there in the rain whilst troops of code-wielding warriors hurl electromagnetic spells from laptops against elevator circuit boards, sump pumps, and garage doors, flooding basements, popping open underground gold vaults, and frying traffic lights, like some gonzo version of The Italian Job wed with the digital wizardry of a new sorcerer class, the "first-line cyber defenders" who will be trained in this place, our 21st-century Hogwarts along the freeway. Then they clean it all and start again tomorrow. Alas. Although this, in many ways, is even more interesting, the entire "test city" truly is miniature: indeed, the whole thing "fits in a six by eight foot area and was created using miniature buildings and houses, [and] the underlying power control systems, hospital software, and other infrastructures are directly from the real world." Nonetheless, this 6-x-8 surrogate urban world will be under near-constant microcosmic attack: "NetWars CyberCity participants, which include cyber warriors from the Department of Defense and other defenders within the U.S. Government, will be tasked with protecting the city's critical infrastructure and systems as they come under attack. Cyber warriors will be presented with potential real-world attacks; their job is to defend against them. Missions will include fending off attacks on the city's power company, hospital, water system and transportation services." Which means, in the end, that this is really just an enlarged board game with an eye-catching press release—but there is still something compelling about the notion of an anointed patch of circuits and wifi routers, accepted as an adequate stand-in—an electromagnetic stunt double—for something like all of New York City, let alone the United States. A voodoo doll made of light, animated from within by packet switches, under constant surveillance in an invisible war. 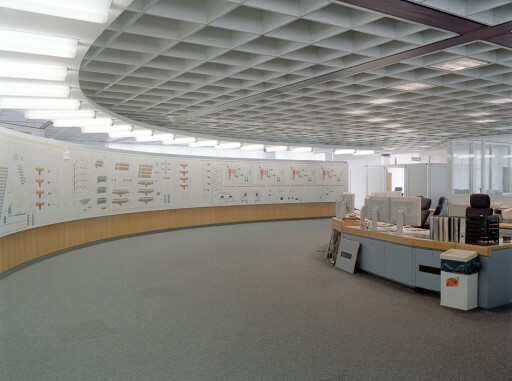 Control rooms are the nerve centers of a world permeated by systems of abstraction. In these concentrated places, the ‘status quo’ of the systems that surround us forms an aesthetic surface. Signals and values serve to make control decisions for the system. 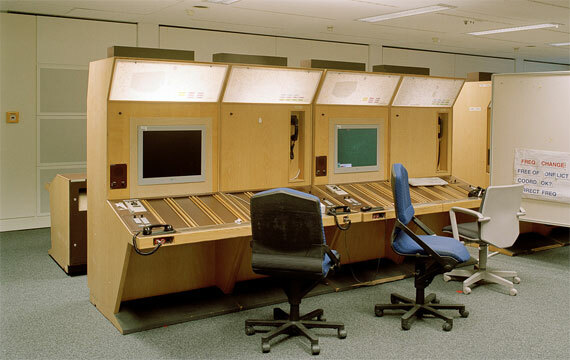 Here the human and the system communicate using the control room as an ‘interface’. However, (information) architectures are only seemingly neutral and arranged according to inherent necessities. 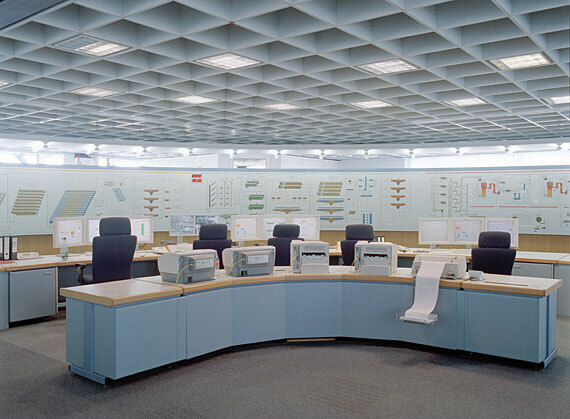 The photo series by Patrick Raddatz reveals how much user interfaces are not purely functional but are a ‘projection screen’ for the utopias of their times; subject to fashion and taste, they ultimately turn into cultural clichés of our society. This text is taken from the NODE10 catalogue, written by Eno Henze and Marius Watz and edited by Valérie-Françoise Vogt.